BACKGROUND: Puncturevine is a naturalized invader from Europe. It spreads by seed and is most often found on sandy, dry, or gravelly sites. Puncturevine produces sharply pointed burs that stick painfully in bare feet and cause bicycle flats, reducing the recreational use of many areas. Seeds may puncture even light truck tires. 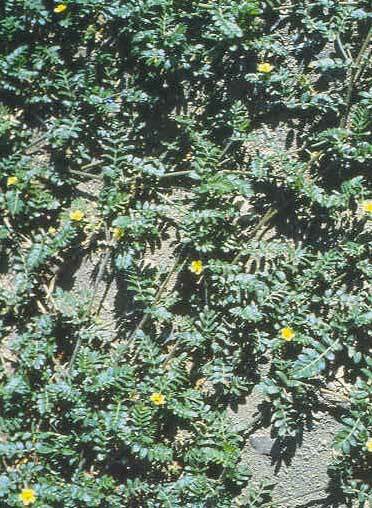 DESCRIPTION: Puncturevine is a prostrate annual that forms dense mats up to 4 feet across. Leaves are opposite and pinnately compound with 4 to 8 pairs of oval, hairy, 1/2-inch long leaflets. Stems branch from the base and from leaf axils and are slender and hairy. Flowers are 5 petalled, yellow, 1/2 inch wide, and borne singly in leaf axils from midsummer until frost. Fruits are roughly circular, splitting into 5 sections, each with 2 large, divergent spines. These tack-like burs contain up to 4 seeds. DISTRIBUTION: Puncturevine is throughout the U.S., except for the northern tier states from Montana to Maine. provide fair to good control in Oregon, but control levels are uncertain in Idaho. Herbicides are available for control of this weed. © 1999 University of Idaho: Text and photographs for these pages from Idaho’s Noxious Weeds, by Robert H. Callihan and Timothy W. Miller (revised by Don W. Morishita and Larry W. Lass). Please contact: Ag Publishing, University of Idaho, Moscow, Idaho 83844-2240; (208) 882-7982; cking@uidaho.edu; or visit the UI Extension/CALS Publications and Multimedia Catalog website at www.cals.uidaho.edu/edComm/catalog.asp, for more information about this or other publications.